By H. Zell licensed under CC BY-SA 3.0 via Wikimedia Commons. At the mention of “vanilla”, the first things I think of are ice cream, cake and other tasty foods. Next, I think of the little bottles of vanilla extract or flavouring that I often use when baking. In turn, that makes me think of the brown, shrivelled vanilla pods I have occasionally used in particular recipes. Vanilla is a popular ingredient in many foods and perfumes, but where does it come from? The answer lies in an orchid called Vanilla planifola (also known as flat-leaved vanilla), which originates from Mexico. The Totonac people of Mexico were the first to cultivate vanilla. In their mythology, this plant was born when Princess Xanat—whose father had forbidden her from marrying a mortal—fled to the forest with her human lover. The lovers were captured and killed, and it is said that the vine of the first vanilla plant grew from the ground where their blood landed (2). This myth reflects how highly vanilla was prized in the Totonac culture. Flat-leaved vanilla is a climbing vine and its delicate greenish-yellow flowers give rise to vanilla pods that contain hundreds of tiny seeds (2). The pods take about 6-9 months to mature on the vine, and then they are harvested, dried and fermented to produce the distinctive vanilla flavour (1), so it easy to understand how the pods became precious to the Totonacs. Vanilla also became popular with the the Aztecs after they invaded Totonac lands. When the Spanish arrived in South America and reached the Aztec leader Montezuma, the Aztecs believed that their creator had returned and presented gifts, including their favourite drink, which was made from cocoa beans (chocolatl) (1). This drink contained vanilla and other various flavours that were previously unknown to the Spanish. Not surprisingly, vanilla soon became popular across Europe. The Spanish kept tight control of vanilla production until the early 1800s, when French entrepreneurs shipped vanilla plants to the Islands of Réunion and Mauritious in the Southern Indian Ocean (2). The early attempts to grow flat-leaved vanilla outside of South America were not successful because the vanilla flowers, which only last one day, were missing their natural pollinators. In 1841, a 12-year old slave called Edmond Albius developed a simple and efficient hand-pollination method using a small pointed stick (2). By 1898, Madagascar, Réunion, and the Cooris Islands produced about 80% of the world’s vanilla (2). 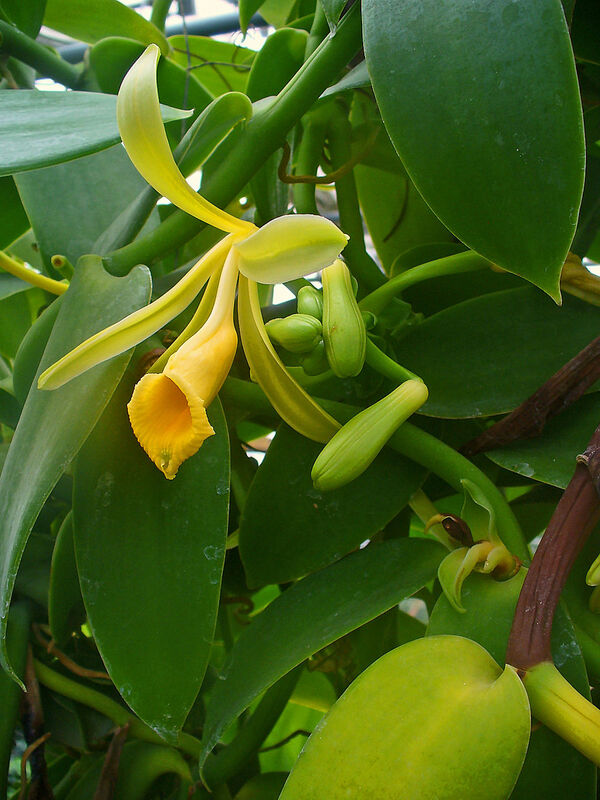 Two other species of vanilla orchid – V. tahitensis and V. pompona – are also cultivated to produce vanilla, but the majority of the world’s supply comes from flat-leaved vanilla (3). Today, the main producers are Madagascar and other islands in the Indian Ocean, and Indonesia. The flowers are still pollinated by hand and, since the production process is so labour-intensive, vanilla is the second most expensive spice in the world behind saffron (2). Vanilla contains more than 250 active ingredients, but the main one that is responsible for its distinctive flavour is called vanillin. Vanilla is so expensive – and the flavour is so popular – that many of the vanilla-flavoured food products we eat are made from artificially-made vanillin. Currently, most vanillin is produced by converting a naturally occurring organic compound called guaiacol, but researchers are also developing methods to produce vanillin from other sources, for example, from a structural molecule found in most plants called lignin. Another possibility may be to use a soil bacterium to convert a compound found in sugar beet pulp, wheat/maize bran and other agricultural waste products into vanillin (4). Unfortunately, I’ve struggled to find out more about this research because much of the published literature appears to be behind paywalls (grr!). Whatever methods we use to make vanillin, the demand for “real” vanilla in premium foods is likely to sustain the livelihoods of the people that cultivate flat-leaved vanilla for some time yet! Flat-leaved vanilla is the Organism of the Month. Apologies for the delay in publishing this post, it has taken me longer to finish than planned due to a combination of a family holiday, illness and the demands of my growing garden! Hurray for vanilla! Interesting history behind the plant, thanks! Fun fact about vanilla that you didn’t mention: It actually performs CAM photosynthesis.